An impressive start as the sole goalie for Miners Hockey Club, Alek Lazarski will return for his sophomore season. Lazarski played a major role in the Miners inaugural season. During the 2015-16 regular season Lazarski had 676 saves in 22 games. With Lazarski back in net for the Miners, 2016-17 looks to be just as promising. “Overall we had a good first season. We made it through the first season hiccups and I’m looking forward to the new teams in our division, adding more players, and becoming a more competitive player,” notes Lazarski about the Miner inaugural season. 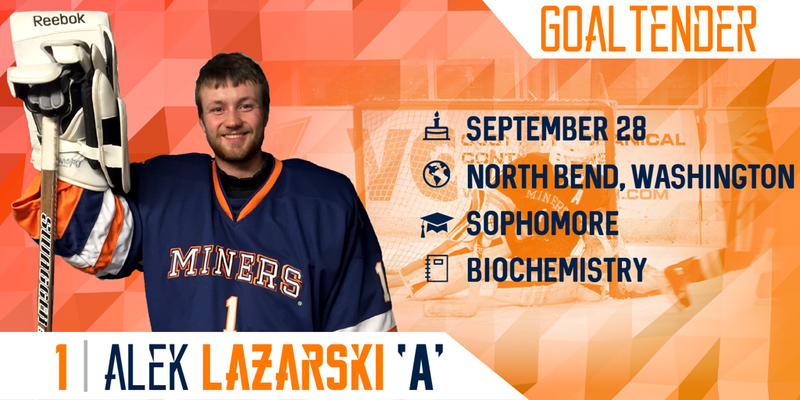 This off season Lazarski will trade in his pads for a lab coat and spend his summer interning with the University of Washington. With the goal of getting a degree in Biochemistry the Miner goalie just completed his first semester as a peer tutor for the College of Science.